We've all had a hateful winter, huh? And the forecast for us this week is bitterly cold. "The better to sew-in, my dear!" 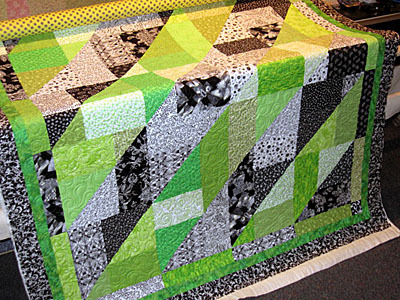 Awhile back I promised you a photo of this "cool" B & W and Lime quilt a customer made from your Turning Twenty Just Got Better book. Isn't it awesome? My class schedules always has one of your many fun and easy patterns! You take care and thing Spring!